Frank is an add-on to Point Purchasing that allows your organization's receiving department to utilize an Apple iOS (iPhone, iPad, iPod Touch) or Android device to perform mobile receiving. Frank has been optimized for speed and accuracy in receiving goods. Simply scan the packages' barcode label and have the PO Number recognized. Frank will display the open items for that PO. 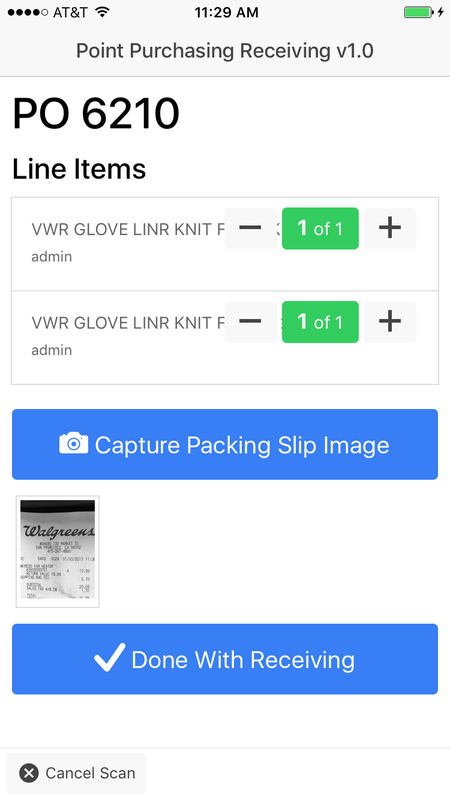 Check off the quantities, add a comment, and optically scan the packing slip (multiple attachments supported). Frank acts like a portable flat-bed document scanner so that packing slips can be attached to the receipt with ease. Frank connects to your organization's Point Purchasing server via Wifi or a mobile plan. Frank™ adds to Point Purchasing by further reducing administrative processes, freeing your receiving agent to quickly receive shipments directly on the loading dock.